On the last day of the regular season, Class A Advanced Fort Myers needed a win and a loss by Charlotte to secure a spot in the postseason. The squad edged Clearwater, 2-1, and after the Fire Frogs rallied past the Stone Crabs, 5-2, the Miracle were headed to the playoffs. 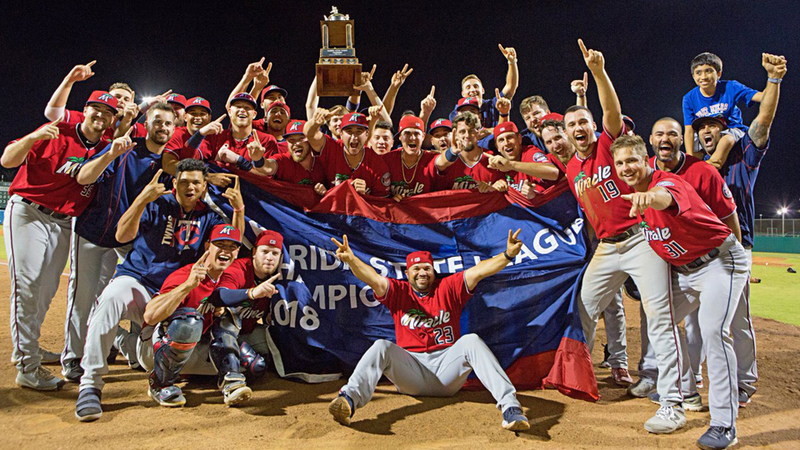 Six games later -- behind a go-ahead three-run roundtripper from Ryan Costello -- Fort Myers wrapped up its second Florida State League title in five years with an 8-5 victory over Daytona in Game 4 of the circuit's Championship Series on Monday at Jackie Robinson Ballpark. "It feels great, man," said Costello, who was acquired from the Mariners in a trade on July 30 and assigned to the Miracle on Aug. 1. A lot of hard work went into this. I've only been here for a month, but from what I understood, the first half was a struggle. So having the chance to come out here and make a difference has been great. But we came out on that last day knowing we had to win the game just to put ourselves in a position to have a chance. We knew if Charlotte won, it was over. But it's baseball, so you never know what's going to happen. We got the 'W,' and then sure enough, Florida pulled out a win and we were pumped." After sweeping the best-of-3 semifinals round against Palm Beach, Fort Myers took a 2-0 series lead -- outscoring the Tortugas, 15-3, through the first two games of the Finals. Daytona avoided a sweep with a 6-2 victory in Game 3 on Sunday. The Miracle collected nine hits in the final game and committed a pair of errors that led to three runs for the Tortugas in the second inning. Costello's blast capped Fort Myers' five-run frame in the third. The 22-year-old turned on an inside fastball from No. 18 Reds prospect Scott Moss (0-1) and deposited it over the wall in right field. The dinger scored 18th-ranked Twins prospect Travis Blankenhorn and No. 29 Jose Miranda -- who each collected an RBI base knock in the frame. "He was a lefty, and he had a running two-seam fastball that he was trying to bust me in with and I kept biting," said Costello, whose long ball was his first career postseason extra-base hit. "So once I fell behind, 1-2, I was just trying to stay short and battle and put together a good AB. And sure enough, I put a good swing on a ball and it left the yard." Right-hander Edwar Colina (1-0) yielded three unearned runs on a pair of hits with four walks and six punchouts for the Miracle. Righty Hector Lujan worked around a one-out single by Cincinnati's 23rd-ranked prospect Alfredo Rodriguez in the ninth by getting No. 11 Stuart Fairchild to ground into a series-ending 4-4-3 double play. "It was out of our control," Costello said. "We really didn't know we were going to be in the playoffs until the very last moment, so that we were here, it just made us feel like we had to make something happen." Top-ranked Twins prospect Royce Lewis went 1-for-4 with a walk and a run scored. MLB.com's No. 10 overall prospect finished the Finals 5-for-17 with three homers, five RBIs and five runs. He collected at least one hit in every game. Minnesota's No. 2 prospect Alex Kirilloff was 1-for-5 with a double and a run scored. The 30th-ranked prospect in baseball went 4-for-18 with two doubles and scored four times in the Championship Series. Ibandel Isabel, who finished the regular season tied with Triple-A Las Vegas' Peter Alonso for the Minor League lead in homers with 36, smacked a two-run dinger for Daytona in the eighth.